You're up early. You've loaded the car last night. You carry the sleeping kids from bed to the warmed-up car and head out into the frosty dark of an early morning, all in hopes of getting first tracks, and a good parking place at the local ski area. Steaming coffee from the corner gas station warms your hands and opens your eyes a bit wider. Pulling into the area, everyone is awake and excited now. You start unloading and kids start dressing. You hear, "Honey, where are my ski boots?" Uh-oh. "Why, I didn't pack the boots, dear. You did." Uh-oh again. The perfect day has just turned in to the perfect mess. For a family day trip, get there early. You'll get a good parking space; no slogging across the frozen parking lot, lugging the kids and gear. Make a reservation at the children's center in advance. When your kids go to ski school, give them their own special bag with their name on everything. Dan O'Connell, the Children's Center Coordinator for the Ski & Snowboard Schools of Aspen, says sunscreen is crucial; it's something they're constantly reminding people to bring. Either way, they still have gallons of it (as do most children's centers) in each room. But it is easier on everyone if you put it on your child before you come. O'Connell says glasses and goggles that fit are frequently forgotten. Children may not want to wear them, but it's very important that they wear them all day, especially at altitude. "Maybe from where they come from, they don't need glasses all day. People don't realize how important it is up here because we're so much closer to the sun, and the reflection of the snow is so bright." Make sure all of your child's clothing is waterproofed. That includes ski pants, jacket and especially gloves. Do not equip your kid with knit gloves. Fingers will turn into little popsicles. Conversely, don't overdress your kid. One pair of socks and long underwear is just fine. Put extra clothes in their bag, if you'd like. And finally, for little skiers in the three-to four-year-old range, let them bring blankie, or binky, or Baby Bop, or whatever they call it. O'Connell says, "Sometimes if they have something that really relaxes them, or that is really comforting, it helps them to get over separation anxiety. And it certainly helps if they become over-stimulated by being in a new environment and away from home." 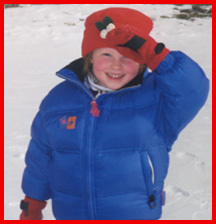 At three-years-old, our daughter used to stick her blankie in the sleeve of her ski suit when she went out. It made her happy and she had fun, so it was fine with me. Be like Santa: "Make a list and check it twice." Ho-ho-ho. Happy skiing! ...... Shannon Luthy is an award-winning radio and TV news personality, anchoring at KSPN in Aspen and CNN. Shannon and her family live in the Denver foothills.